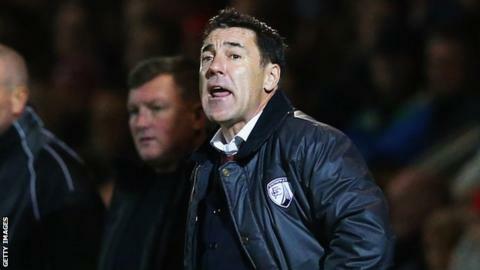 Chesterfield parted company with manager Dean Saunders following their fourth-straight defeat as Swindon cruised to victory. Nicky Ajose put Swindon ahead by firing home Bradley Barry's cross before Louis Thompson fired under Tommy Lee. The hosts came close to reducing the deficit when Dan Jones volleyed over while Jay O'Shea hit the crossbar. Swindon's third came when Ben Gladwin teed up Jon Obika to score before Ajose sealed it with a cool finish late on. Match ends, Chesterfield 0, Swindon Town 4. Second Half ends, Chesterfield 0, Swindon Town 4. Ben Gladwin (Swindon Town) hits the right post with a right footed shot from outside the box. Corner, Swindon Town. Conceded by Thomas Lee. Attempt saved. Jonathan Obika (Swindon Town) right footed shot from the right side of the box is saved in the centre of the goal. Corner, Chesterfield. Conceded by James Brophy. Corner, Chesterfield. Conceded by Jordan Turnbull. Attempt missed. Emmanuel Dieseruvwe (Chesterfield) right footed shot from outside the box is close, but misses to the right. Corner, Chesterfield. Conceded by Brandon Ormonde-Ottewill. Goal! Chesterfield 0, Swindon Town 4. Nicky Ajose (Swindon Town) right footed shot from the centre of the box to the bottom left corner. Assisted by Fabien Robert. Ellis Iandolo (Swindon Town) wins a free kick in the defensive half. Substitution, Swindon Town. Ellis Iandolo replaces Louis Thompson. Attempt missed. Jay O'Shea (Chesterfield) right footed shot from very close range is just a bit too high. Emmanuel Dieseruvwe (Chesterfield) is shown the yellow card for a bad foul. Attempt saved. Jonathan Obika (Swindon Town) left footed shot from the centre of the box is saved in the centre of the goal. Bradley Barry (Swindon Town) wins a free kick in the defensive half. Attempt saved. Emmanuel Dieseruvwe (Chesterfield) right footed shot from the centre of the box is saved in the centre of the goal. Corner, Chesterfield. Conceded by Bradley Barry. Substitution, Chesterfield. Chris Herd replaces Daniel Jones because of an injury. Substitution, Chesterfield. Emmanuel Dieseruvwe replaces Lee Novak. Sam Morsy (Chesterfield) is shown the yellow card for a bad foul. Anton Rodgers (Swindon Town) wins a free kick in the attacking half. Goal! Chesterfield 0, Swindon Town 3. Jonathan Obika (Swindon Town) left footed shot from outside the box to the bottom left corner. Assisted by Ben Gladwin. Second Half begins Chesterfield 0, Swindon Town 2.